These little trees are so whimsical, fun and perfect for littles to help with! This would be a great project for them to learn how to sew buttons on. I found buttons at Michael's for about $2.50 a package. I purchased one package of multi-colored buttons and had buttons left over after the six ornaments I made. Print this tree template. You may need to play with the size of the template a bit. I always do. I just copy the page with the percentage I want until it's right for what I envisioned. Cut out fabric. You will need to cut two trees per ornament you want to make. 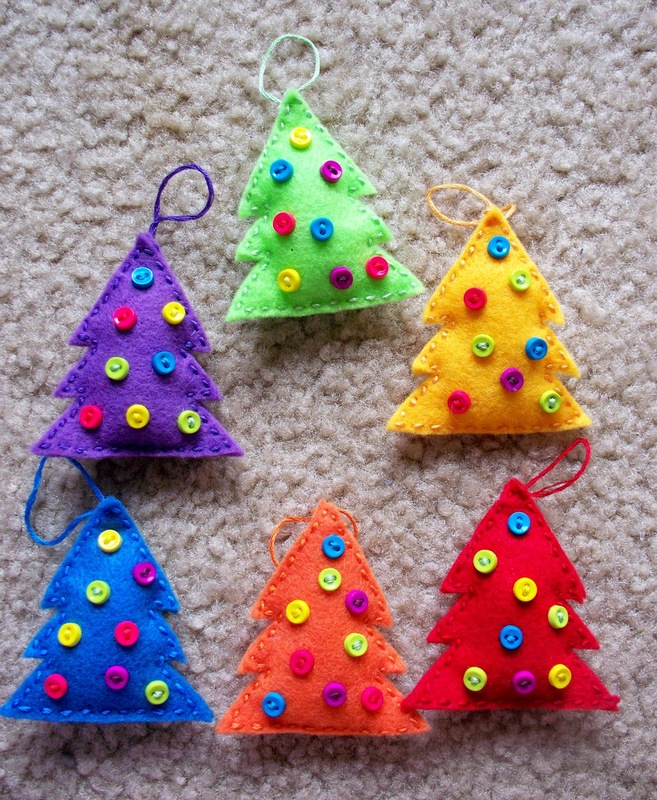 Using thread and needle, sew loops on the second piece of felt for each ornament. Next, sew buttons on the trees. I used about 8 buttons per tree. Sew the trees together, leaving an opening. Stuff fiberfill inside each tree to make them plump and full. Don't hesitate to play with colors on this ornament. I love the idea of using just one color of buttons or two colors of buttons or whatever you want. You could make a red tree with green buttons or a blue tree with red and white buttons for a patriotic theme. This ornament is easily customizable for your gift recipient, which makes it a winner in my book!